The mission of the Cable Academic and Vocational Education Center is to provide all students with a supportive educational environment which nurtures their ability to maximize their individual potential and strengthen their social and academic experiences, now and throughout their lifetimes. The Cable Academic and Vocational Education Center (CAVEC) is a private, special education school that focuses on empowering students to develop their skills and become lifelong learners. 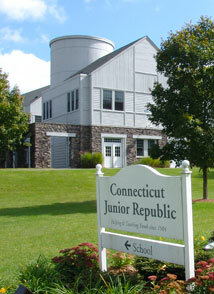 Programs for boys are provided at CAVEC on CJR's Litchfield Campus and services for girls are provided at CJR's CAVEC location in Bristol. Each student’s abilities are assessed and curricula are designed to meet their Individualized Education Plan (IEP). The ultimate goal of each education plan is the development of requisite skills for school success and transition to post-secondary opportunities. The Cable Academic and Vocational Education Center is accredited by the New England Association of Schools and Colleges (NEASC) and licensed by the Connecticut State Department of Education as a private, special education program. For more information about the Cable Academic and Vocational Education Center in Litchfield, please click here. For more information about the Cable Academic and Vocational Education Center in Bristol, please click here.